PPG Industries, Inc. PPG is implementing a global price hike of 8-10% on all packaging coatings products globally. The price rise will be put into effect on Oct 1, or as contract permit. Cost pressure related to raw materials, labor, freight and distribution across all regions has led to the hike. PPG Industries noted that the price increase actions are vital for sustaining its commitment toward innovation and development of next-generation coatings. The company also remains aggressive in its efforts to cut expenses. 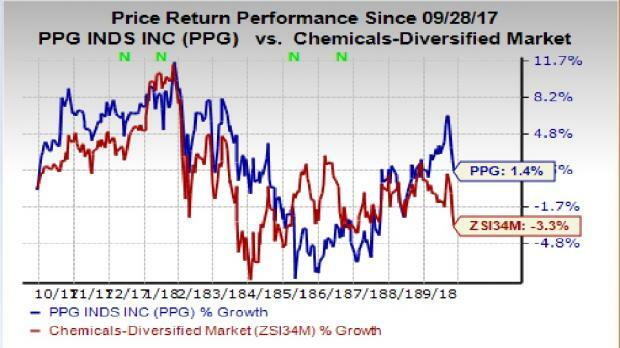 In a year’s time, shares of PPG Industries have outperformed the industry it belongs to. While the stock has gained around 1.4%, the industry saw decline of 3.3%. PPG Industries, during its second-quarter call, said that it does not expect any respite from inflationary cost pressure in the third quarter. The company expects to continue its earnings-accretive cash deployment in the second half of the year. It is committed toward spending $2.4 billion of cash on acquisitions and share repurchases in 2018. The company also initiated a restructuring program and expects it record annualized savings of roughly $85 million, once it is fully implemented. During the second quarter, PPG Industries’ Industrial Coatings segment sales and total sales volumes improved year over year. Acquisition-related sales contributed to the growth. Notably, Performance coatings segment sales increased year over year on the back of favorable currency translation. PPG Industries is a Zacks Rank #4 (Sell) stock. Some better-ranked companies in the basic materials space are ArcelorMittal MT, CF Industries Holdings, Inc. CF and Air Products and Chemicals, Inc. APD. ArcelorMittal has an expected long-term earnings growth rate of 4.8% and a Zacks Rank #1 (Strong Buy). The company’s shares have gained 25% in the past year. You can see the complete list of today’s Zacks #1 Rank stocks here. CF Industries has an expected long-term earnings growth rate of 6% and a Zacks Rank #2 (Buy). The company’s shares have rallied 57.6% in the past year. Air Products has an expected long-term earnings growth rate of 16.2% and a Zacks Rank #2. Its shares have risen 10.9% in a year’s time.